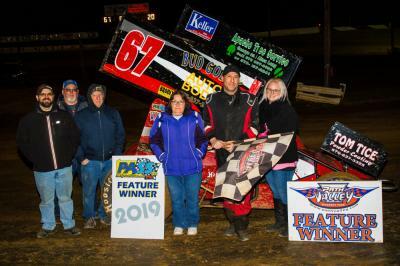 The Selinsgrove resident made a low-side pass of Kyle Ganoe just past the halfway mark in the race and worked lap traffic over the final laps to grab the win. Ganoe held on for a runner-up finish, followed by hard-charging John Walp (up from eighth starting spot), Jeff Weaver and Devin Adams. After taking a weekend off, the PASS/IMCA sprinters tackle their first two-race weekend on April 6 and 7, joining the 410 sprints and late models Saturday night at Port Royal Speedway and running with 410 and 358 sprinters Sunday evening at BAPS Motor Speedway. Ganoe grabbed the early lead from the pole position, with outside front-row starter Dave Grube spinning on the first lap. That moved Cale Reigle into second place, and that pair led the field for the first nine laps until a red flag for Kyle Keen’s tip-over after an incident with Austin Graby. On the restart, Duke passed Reigle, then chased down Ganoe. The race went under caution one last time when Reigle damaged his steering in an encounter with an infield marker tire. Duke pulled away when the green flew again and worked traffic to perfection until the checkered flag. Completing the Top 10 were Jared Zionkowski, Kassidy Kreitz, Daren Bolac, “Nitro” Nick Sweigert and Jake Frye. Reigle and Zionkowski were the heat race winners for the 16-car field.